The most powerful need we have as human beings is to feel a connection between ourselves and another. It is necessary for survival as infants – and equally so throughout our lives, though it does not need to be with just one person. Some people choose to remain alone but develop meaningful relationships with others as friendships. One of the characteristics of such relationships is what our friend, Dr. Gerald Bauman, labeled “Serious Talk.” In serious talk we talk about our lives, our feelings, our problems, our hopes and dreams, our conflicts and failures. It takes a great deal of openness and trust to find people capable of receiving these inner feelings and parts of our lives. But it is in that sharing that connections and love emerge. Jerry was one such friend that Armin and I shared our lives with. It is through relationships that we search for those connections. In romantic relationships, our hormones of attraction begin the process and act as powerful catalysts. But we must also experience the connection in deeper more intimate ways for love to grow and endure throughout the changes that life brings to us. To be open to another is to take that risk – to share who I am and to want to know who you are. Most often we choose a person for a relationship because the chemistry attracts us – that is because there is something familiar about the person – but the basis for that chemistry is often something we are not aware of – lying under the surface of our awareness are feelings we experienced with our mother or father. If there is something about those early relationships that has been difficult, sometimes people consciously say, “I don’t want to have a relationship like that.” But if we do not do our relationship homework, i.e. therapy or an equivalent process of reflecting about the relationship we want, we may end up in relationships that do not work. And then we continue from there. Individual people want different things in relationships. Sometimes people find a partner who has the same degree of openness as yourself and you are comfortable with each other. That works and can be a very positive relationship where each can talk about what they want in the relationship, in their lives going forward. But if life sends an unexpected crisis, it sends the relationship into imbalance; the openness is not adequate for the situation at hand. And people respond differently to crises and loss. One partner may be more uncomfortable at the level of openness that has worked before but may not feel safe in sharing that pain with the other. It suddenly feels as if you are in a strange land or foreign emotional territory. Our usual response is to shut down emotionally, to withhold feelings, to share less, not more. It may even feel as if the relationship is threatened – and then you are frightened. At those times and in those situations, I can help you to open to your experiences and find a way to share with the other what you are feeling. When that kind of crisis is navigated successfully, the relationship moves to a different level of connection and openness. You have weathered a storm together and come through it. Our earliest human experience occurs when an infant experiences consistent nurturing by people in the baby’s life. Being fed when hungry, changed when wet, being held and responded to when crying tells the infant that mother and father are there – or grandmother or nanny. The easiest way this occurs is when the mother nurses the baby – the physical contact, being held and fed relaxes the infant and reassures her/him that she is cared for. The same feeling occurs if the baby is held when fed but not when the bottle is propped! Infants are not passive recipients in this process. They cry when hungry, uncomfortable, the milk not agreeing with him, producing gas and cramps, when no one responds to their cry. Watch or ask any parents of newborns and you will see and hear this process. It is called attachment – the feeling of care and connection securely experienced by the infant. It is also love because the feelings that emerge in all of this are that someone cares. Our first experience of the world thus reassures the baby that she/he is not alone – that people respond. This earliest experience lays a foundation for feeling loved and trusting – and influences how we connect or don’t with others. You can see this next step happening when people hold and smile at the infant – and soon the baby begins to smile in return. But many infants do not have this experience of attachment. There are countless reasons and circumstances that interfere with attachment, leaving the baby uncertain that she will be responded to. One powerful example is in the book and film, Philomena. As an unwed mother in 1950, in Ireland, Philomena is sent to Rosecrea Abbey, Sisters of the Sacred Heart. Her baby, Anthony, is born there and stays with her for his first three years. Even though the mothers are allowed only one hour a day with their baby, a strong attachment is there between Philomena and Anthony. And then he is taken away from Philomena for adoption in America – sold by the sisters. 50 years later on Anthony’s birthday, Philomena finally tells her story to her daughter who connects Philomena with journalist, Martin Sixsmith. Together they begin the journey to find Anthony. Philomena says, “There has never been a day I did not think of him.” It is not surprising that, as an adult, she remembered. But her three year old son, Anthony, remembered also, more fleetingly but he remembered. Both mother and son made many attempts to find each other, thwarted by the nuns. Anthony, growing up as Michael A. Hess became a very successful attorney while hiding his gay life. But he finally found love and told his partner that he wanted to be buried at Rosecrea Abbey, “knowing that his mother would eventually find him there.” The film is very touching. The book has much more detail about the cost to Anthony, told that his mother gave him away – that she did not love him. His alternating times of love in gay relationships and times of self-hatred and engagement in unsafe sexual practices cost him his life due to Aids. The striking part is the explicit self-hatred he inflicts on himself in the (mistaken) belief his mother did not love him. There are many ways the absence of attachment occurs – from benign neglect to overt abuse. If you have experienced this lack of attachment and suffer from the inability to find and sustain loving relationships, I hope you will call me. The process of healing is difficult but it is not too late to learn to nurture yourself. I am here to be with you. Camille Claudel was born in 1864. She modeled shapes as a young child and her identity was already established as a sculptress when her teacher handed her students over to Auguste Rodin in 1883. She was not yet 20, extraordinarily beautiful, with great energy, imagination and will. She began to work with Rodin, helping with his pieces. Her work showed “great sensibility and surprising maturity.” Their passionate connection is apparent in their work. In 1886, their affair had progressed to her demand that she be his only pupil – and wife. She helped him in his growing reputation; she blended her art with his. "She was Rodin and Camille Claudel," an unbreakable liaison. In 1893, when Rodin refused to end his relationship with Rose Beuret, Camille realized he would not marry her – She sculpted her powerful piece, “The Mature Age.” She portrayed herself as imploring, humiliated, on her knees. She was not able to get grants to support her work and her reason collapsed in the aftermath of all of this. She was confined to an asylum where she remained the last thirty years of her life. Records indicate that her family kept her there despite many efforts to discharge her as not insane nor in need of confinement. Her mother never visited her there and her brother seldom. Her story is told in film, “Camille Claudel", other biographies and her work shown at different times. There is a powerful message in Camille’s story – especially for women – that we must sustain our own identity and be able to support ourselves economically – as we also engage in passionate relationships. If you know what you want but are confused or afraid to act, I can help you explore what is keeping you stuck. It doesn’t necessarily mean you will act, but it does mean you will understand the complexity of the issues involved and approach the situation more aware of the risk, the potential impact on yourself and others, the benefits that might come and how you might navigate the process more effectively. Addie has thought about it, decided to take a risk and asks Lewis (using her voice) if he would do that. Getting what we want often means taking a risk and acting on it. It doesn’t mean we always get what we want, but if we don’t ask or act, it’s certain that nothing will happen. The story is worth reading to see what happens between them – and how it plays out – which is another issue when children and grandchildren get involved when we are older. The story is bittersweet, involving advanced age and the emergence of hope. 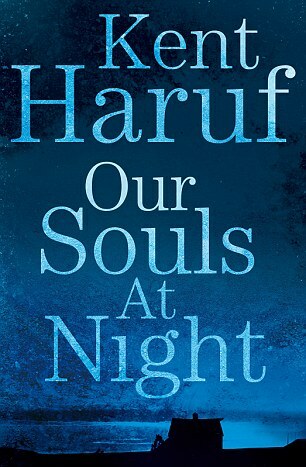 Haruf died at 72 in 2014 – so he was writing from the perspective of age and the ending of life. Perhaps the awareness of the ending of life makes it possible to take a risk – but we do not know how long our life will last. We need to make the most of the time we have – to make our lives worthwhile.